Firefox 13 is available for download and update. 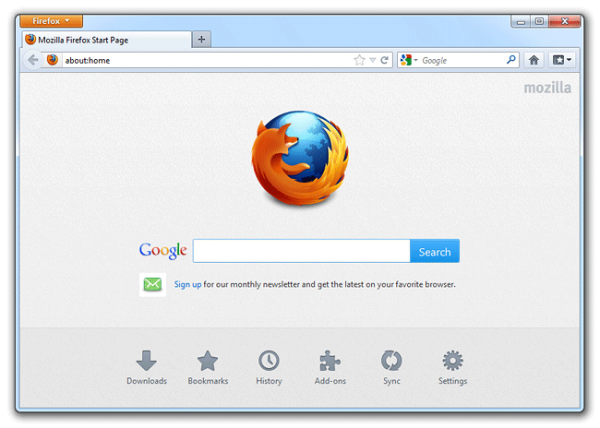 In this version Mozilla introduced a new features for the default home page and for new tabs. The default home page contains a handy Google search and quick links to downloads, bookmarks, history, add-ons, sync and settings. Also, if you had tabs open the last time you used Firefox you can restore them from the home page with a single click. Instead when you create a new tab, Firefox shows your top sites. You can pin sites to this page, rearrange the layout or even turn it off if you wish. Here is a quick hack how to display the Top Sites on the Firefox Home Page. Tracking is a term that includes many different methods that websites, advertisers and others use to learn about your web browsing behavior. This includes information about what sites you visit, things you like, dislike and purchase. 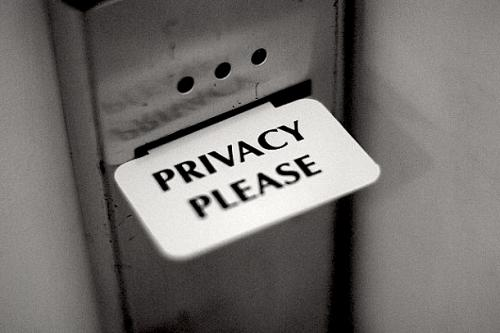 They often use this information to show ads, products or services specifically targeted to you. Are you running Windows on a 64-bit machine? Do you want to make Firefox even faster? 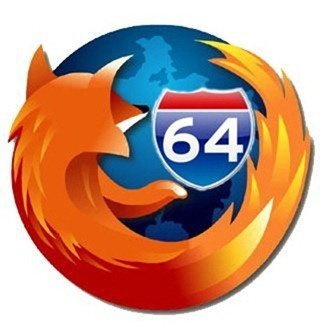 Meanwhile Mozilla is working on Firefox9, Waterfox compiled the Firefox source code to run specifically for 64-Bit Windows computers. 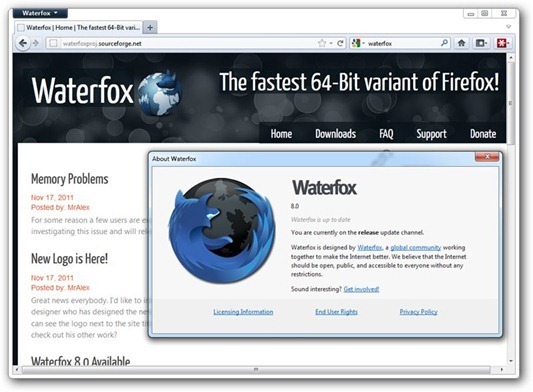 To make Waterfox stand out a bit more, it’s compiled with optimizations so that it will run more efficiently and faster than just compiling Firefox as a 64-Bit program. In benchmarks, the 64-Bit variant of Firefox out-performs the 32-Bit variant. Also because this variant is being built specifically for Windows, there might be further performance increases. 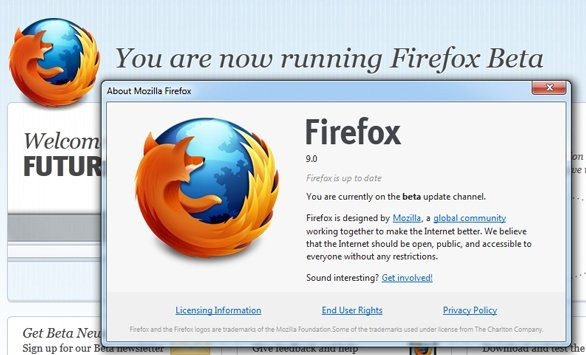 Mozilla released another update to it’s Firefox 9, now in Beta 3. Mac OS X Lion Support: Firefox Beta has a new look that matches the Mac OS X Lion application toolbar and icon styles. Firefox Beta also supports the two finger swipe navigation gesture and makes it easier to use multiple monitors. Chunked XHR Support: Firefox Beta supports chunking for XHR requests so websites can receive data that’s part of a large XHR download in progress. This helps developers make websites and Web apps faster, especially those that download large sets of data or via AJAX. If you’re a developer, you can visit the Firefox for Developers page. As Mozilla updated Firefox 4 Beta with Sync, here is step by step guide how to configure your account and stay synchronized with the same data on different device. We can access Sync by clicking the Sync logo the bottom right corner on Firefox or press Alt from your keyboard if your menu is hidden and then select Tool->Set Up Sync. Yes, World’s Best Browser 3.6 is available for download. 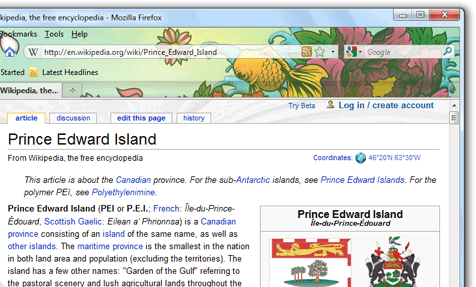 Mozilla today released Firefox 3.6, the first upgrade to the open-source browser since last June. The new browser includes built-in support for the scaled-down browser skins dubbed "Personas;" adds support for new CSS, DOM and HTML 5 technologies, as well as for full-screen video and the open-source Web Open Font Format (WOFF). Firefox 3.6 also boasts a new security feature that checks browser plug-ins, such as Adobe’s Flash Player or Apple’s QuickTime, to make sure they’re up-to-date, then blocks vulnerable plug-ins from loading and shows users how to update the software. 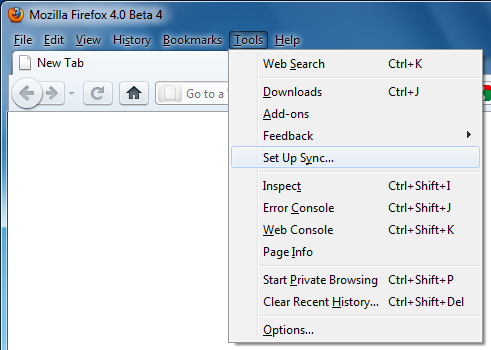 Mozilla added some plug-in checking to older editions starting last September, but fleshed it out in Firefox 3.6. What are you waiting for! 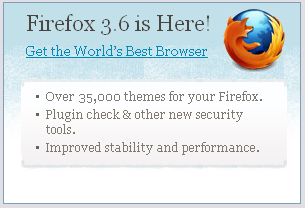 Download Firefox 3.6 Now! Mozilla has release the first beta of Firefox 3.6, which introduce a partial support for Windows 7, optimized to run on small device operating systems and promises to improve the speed more responsive than previous versions. Firefox 3.6 Beta is built on Mozilla’s Gecko 1.9.2 web rendering platform, which has been under development for several months and contains many improvements for web developers, Add-on developers and users. 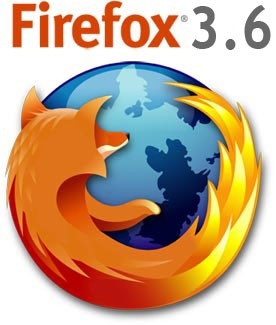 Firefox 3.6 – code-named Namoroka introduces very few visible changes from the current version 3.5: Most of the improvements are in fact under the hood. Among the few exceptions is the native support for the new Windows 7 taskbar, with the exception of Jump List.